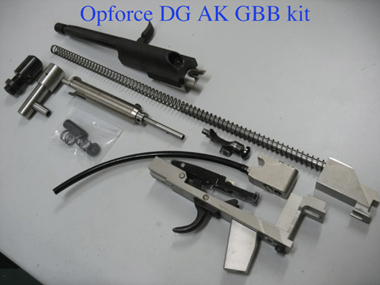 Hi, We now have our Opforce DG ak GBB drop in kit on sale now just 499us. These are one of a kind custom pieces. Nickel plated steel give the internals strength and reliability. Adjustable fps, and rof via the air rig. Uses hpa, hydrogen, or co2. Pieces will be produced in limited runs. With our well known system the GBB kit uses your aeg mag. It can be ran in freezing weather with no cool down effect. A perfect cold weather kit. With rigorous testing, these were made to take a beating. The hardest hitting system with the most felt recoil on the market. We also give you a warrantee. specs. 140 psi = 450fps with 18 rounds per second. 90 psi = 300fps at 12 rounds per second.